As a ghostwriter, one of the Big Questions I get from prospective clients is how I can possibly write a book that sounds like them. Most people – not all, but most! – don’t want to hire a ghostwriter and end up with a book that reads like somebody else wrote it, even if it’s good. So how do I make sure that I’m able to “channel” my clients’ voices, so their book not only sounds like them, but actually comes directly from them? The best way I can explain the process is to introduce you to an amazing woman and client of mine, the lovely Chelsea Berler. Chelsea is the founder and CEO of Solamar Agency, a super-creative boutique marketing shop that serves businesses all over the country. And she’s only 30. Chelsea’s book cover — beautiful, no? LISA: Why did you decide to write a book? CHELSEA: Honestly? Because a good friend who is also a business coach told me to! But I also wanted to reach people. I wanted people like me, who maybe don’t fit in the usual boxes, to know they’re not alone. LISA: And why did you decide to work with a ghostwriter? CHELSEA: I feel like my writing lacks polish, and knew I needed someone to guide me through the process of telling the story and make sure it was clear and easy for readers to relate to and understand. 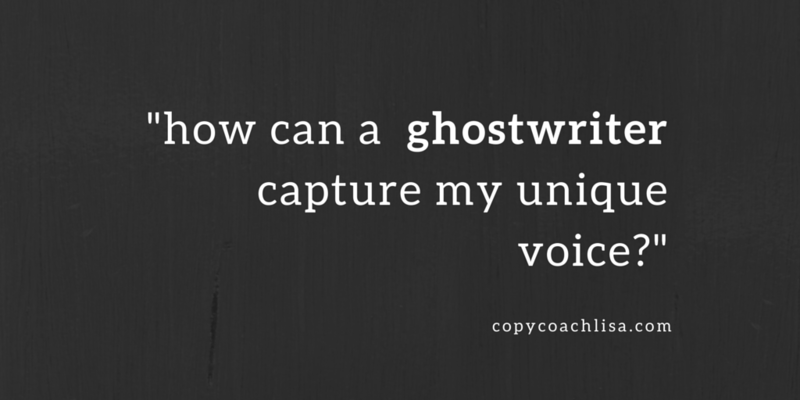 But I was also worried that a ghostwriter wouldn’t sound like me, and that the story wouldn’t end up being my story. LISA: And is that what happened? LISA: I remember that first, you told me your story over the phone, and I recorded it so I could get a sense of how you expressed yourself in words. After that I sent you fairly detailed questions to answer for each chapter – you answered them in writing, and I pulled a lot of the writing directly from those answers. I was able to use a lot of what you wrote and just embellish it. CHELSEA: It’s true. I was surprised how much of the book came out in my actual words. LISA: Was the process fun? CHELSEA: Because my story was a little bit difficult, I found it to be kind of a sad process for me. But that was just me kind of grieving and experiencing things over because I had to talk about ‘em. In the end, it was super therapeutic and there were a lot of fun parts. LISA: How did you feel about the results? CHELSEA: I read the book several times after it was done and I just couldn’t believe it was my story. It was so well-written. LISA: Do you have any advice for someone who’s thinking about writing a book? CHELSEA: Everyone has a book in them – some a little more special than others. It will change your life, it will impact others, it will be one of the biggest accomplishments you’ll ever do. But I’m not going to lie, you need to invest time and money into it to do it right. Just think of it this way – if this is the only book you’ll ever write in your entire life, don’t cheap out. Do it full out. You’ll be more proud of it because of that. The method I used with Chelsea isn’t the method I use with everyone – every client has their own “best way” of telling their story, and my job is to help them find it and then capture it on the page. If there’s a story inside you that’s waiting to get out, and you’re thinking about hiring a ghostwriter to help you tell it, you can find out more about me at www.gethipcreative.com. 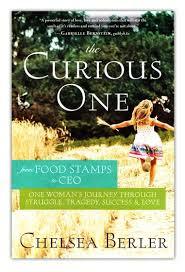 Chelsea’s book, The Curious One, is available on Amazon and on her own website, www.mostlychelsea.com. From Idea to Manuscript in Less than Three Months? If you’ve been considering writing a book with a copy coach (like me!) you might be wondering what that might look or feel like. Instead of just telling you, I thought I’d enlist the help of one of my favorite clients, marriage therapist Carol Erb, PhD, to help me explain. CAROL: I spoke with you when I was first interviewing coaches and ghostwriters, and I liked your enthusiasm and you were fun and enjoyable to talk to. But a literary agent was interested in my book and the literary agent recommended another coach/ghostwriter to work with – the coach was familiar with the Christian genre and I thought that would align well with the literary agent. The result was basically total disappointment. He was late or would cancel our coaching calls and reschedule, which was very frustrating. He also under delivered – the book was supposed to be done in 3-4 months, but I only had 1/3 of a manuscript at 7 months. Plus, I learned that having a male assist me was not a good fit – he didn’t write in my voice, so “my” book didn’t sound like me. So I called you again, and you made me feel extremely comfortable and unashamed about hiring you to work with me even though I had passed you over initially. I hired you because I got such a good feeling the first time we talked, and also because you believed in me and you had a specific plan for me. LISA: How did we get started? CAROL: I gave you a basic overview of my book and then you helped me begin with a timeline. We discussed the content of each upcoming chapter weekly and then you helped me narrow down what to write about for that chapter. LISA: What was different about working with me? CAROL: The other writer took control and did the writing himself — I just gave him suggestions, and the longer we worked together, it became more of his book than mine. You saw my abilities and encouraged me to write my book myself. LISA: Why did our system work for you? CAROL: Because you believed in me as a writer and didn’t let me get off easy by saying you would do the writing — it gave me the confidence that I could write and you affirmed that in me. It was extremely empowering to me. Because of that confidence I soared and the book turned from just a book tomy book! I could not believe how easy you made the entire book writing process. You held my hand and led the way. I trusted you and believed in you as my book coach. You became a personal friend on my journey, which for me was totally unexpected. It was so natural and so easy for me. The whole experience of writing my book was more like sitting down on a cozy loveseat with a friend, coffee in hand, telling a story. LISA: How were you able to stay on track? CAROL: I had a total vision from start to finish because of your direction. It helped immensely to have our coaching calls recorded so I could review them later. It was also a help for me when I needed another eye on my manuscript and especially when I needed some tweaking when transitioning a new chapter or introducing a new thought. LISA: How did you feel about the amount of time it took? It was easy to write, but the concentration, laser focus and time devoted to writing is not for the faint of heart. That said, there is a tremendous feeling of authenticity and satisfaction that has come to me in my ability to say I am an author — because I wrote the book myself. LISA: Do you think it’s possible for other people to finish a manuscript as fast as you did? CAROL: Yes. But they have to be invested in the project and know that it will be what they are focused on for those few months. Their social life and everything else has to be put on hold. And it doesn’t hurt to have a husband or partner who makes your breakfast, lunch and dinner for you while you write! LISA: How long do you think it would have taken you to write it on your own? CAROL: I would not have written this on my own. I needed someone to believe in me, guide me, encourage me, cry with me and laugh with me through the process. LISA: Any advice you would give someone else who’s trying to write a book? CAROL: Writing a book is a deeply personal journey. A book represents every aspect of yourself — your experiences, your thoughts and feelings. You must have a book coach who is respectful of the totality of who you are. If you don’t feel you have a good fit with your coach, you most likely will not write authentically because you may very well hold back in your writing due to fear of rejection or fear that what you have to say is not worthy to be read. You must have the confidence that your coach believes in you, has your best interest in mind, is trustworthy when you need correction and you both honor each other in your work together. LISA: Thanks so much Carol, I know this will be a big help to people who are wondering what the book coaching experience is like. I can’t wait to see the finished product! So…what have we learned? If you’re planning to write your own book, be prepared to have no life…at least for a while! But if you stick with it, it really can (and will) happen. And if you need some help, check me out at www.copycoachlisa.com. Carol’s book, Enveloped, is due to be published in June of this year. Find out more about her at drcarolerb.com. A week or so ago, I made what I thought was a no-brainer of a commitment. I promised myself that I would blog once a week. Since writing is a big part of my job, this seemed like a pretty simple task. I’d just sit at my desk and, instead of spending the next 45 minutes or so writing for one of my clients, I’d write for me. I’m embarrassed to say I’ve always been too lazy to blog. But I know how important it is to be “visible” and get “exposure” and have a “platform.” And since I’m a writer, there’s probably not a better showcase for my writerly brilliance than an opportunity to write about whatever I want, right? So I decided, yes, I would do this. I started last week. And, ohmigod, it was easy. In less than an hour, I had a blog post that didn’t make me want to throw up, all written and ready to go. I was on such a high, I even came up with concepts for my next two posts, just because I COULD, dammit! This blogging thing? It was gonna be cake. It was going to be hilarious, and meaningful, and relatable, and all those good things. But when I sat down to write, all that came out were a random series of thoughts and sentences and beginnings and middles that had essentially no relation to each other, except that they somehow involved my kid. Where were the brilliant sentences, the hilarious one-liners, the clever turns of phrase? They were buried somewhere deep in my brain – if they had ever really existed at all. Because, horror of horrors, I had writer’s block. Ordinarily, writer’s block is something I know how to deal with. I have a system I use and everything – since writing can be essential to my being able to eat. That system is, in a nutshell, stop trying to be so creative and just write the facts. That’s when I realized I had forgotten what the facts were. What was it I had wanted to write about Dave in the first place? and why was I so sure it would be clever and interesting and funny? Because, hey, from where I was sitting, it looked more like a pile of self-indulgent drivel. So I moved on Plan B — Write Something Else. And decided that, since I was in the midst of a genuine, real-life episode of writer’s block, I could write about that. After all, wouldn’t that be valuable and interesting? For a writer to share a real-time, warts and all look at what writer’s block looks and feels like? Guess what happened when I opened a new file and started writing about writer’s block? Well…nothing you’re going to see here. So it was on to Plan C – also known as, Screw This – I’ll Write it Tomorrow. And that’s basically why you’re reading this now, instead of some amazingly witty essay effortlessly illustrating the many hilarious parallels between parenting and coaching. But I did manage to write something. And sometimes, when you have writer’s block, something is enough.